5/8" x 6' Yale Woopie Sling (Adjust from 2.5' to 6'). Adjustable sling that has a permanent eye at one end and an adjustable eye at the other end to accommodate a wide range of trunk diameters. The adjustment allows choke control and minimizes the number of fixed length slings required. 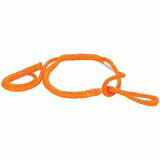 The sling is a braided non-torquing polyester rope with urethane coating. The coating provides increased sling durability. Each sling has a permanent rating tag attached. Rating by application: Choker 2,562 lbs. Vertical 3,203 lbs.